prior to putting pen to paper (an archaic term used by those of us in the media, pretty much rendered useless by the common or garden word processor), i had a quick check through the velominati rules to see if there was anything covering the situation i am about to propound. and though there are one or two which skirt the edges of the issue under consideration, there are no specific directions that might might come under the heading of mandatory. though not everyone either agrees or indeed, capitulates, by common consent, full team kit is intended to be worn solely by members of the team, unless of course we're talking about retro kit representing a cycling team no longer in existence. though i do have both movistar and sky team kit, the latter resplendent with my name and nationality on the side panels, i feel safe enough dressing in either, on the basis that they were sent for review and i may have to provide myself with a second opinion from time to time. i might also remind myself that i did not pay cash money for either, and thus claim exemption. however, the situation that currently gives cause for concern is quite what to wear with what and which is seemly so to do. for instance, i would expect nothing less than a verbal berating from my fellow pelotonese were i to arrive at debbie's of a sunday morning clad in a solo jersey matched with rapha shorts. similarly, were i to be seen wearing an endura equipe jersey with lecol bibshorts, i would expect the same treatment as one arriving without mudguards on a rainly day. it is thus incumbent upon the modern velocipedinist to ensure that the cycling wardrobe is maintained in some semblance of order, lest leaving in a hurry results in such a sartorial faux pas. however, there is, i believe, the cycling equivalent of a dulux colour that matches every other shade in the house. 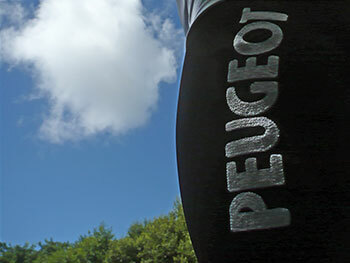 and just to make life even better than it already was, the bibshorts of which i speak embody the essence of retro by having the word peugeot embroidered on each leg. yes, indeed, probably the best selling jersey in the prendas armament is that of yesteryear's peugeot , a jersey worn by eddy, tom and robert, though all at different points of history. 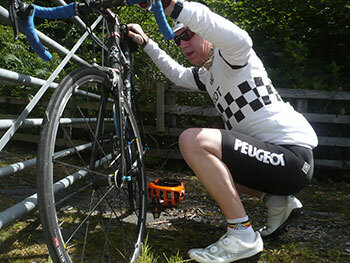 sadly team peugeot is no longer a part of the modern day circus, and you'll probably struggle manfully to find a modern incarnation of the bicycle that gave rise to the wording on both jersey and now shorts. many a purveyor of vintage bicycles has a steel peugeot on offer, and it's not so very long ago that billy bilsland's in glasgow acquired robert millar's peugeot from the 1980s (even if it was a tvt carbon with peugeot badge). so while it would take an extra bit of effort to grab hold of an appropriately badged bicycle to match any clothing you may have, i have it on good authority that wearing peugeot apparel while riding colnago, focus or pinarello can only but add to one's je ne sais quoi. and even if you haven't yet got around to acquiring a chequerboard jersey, these fabulously embroidered bibshorts are definitely the bees knees (whatever that actually means). i'm embarrassed to say that i initially thought the applied lettering was of a particularly tactile screenprinting; the fact that it turned out to be carefully yet boldly applied white thread only added to their superbness. even were there a velominati rule forbidding such typographical largesse, i'd be more than happy to ignore such a directive with impunity. but aside from their manifest fabulousness, what are they like to ride? in the best tradition of exceptional shorts, you'd barely know they were there, something i figure is the ultimate compliment that can be paid to a pair of cycle shorts. they are a tad shorter in the leg than one or two others on the market, but that's all part of their retroness, and demonstrably not too short that those precisely chiselled tan lines will feel disoriented. 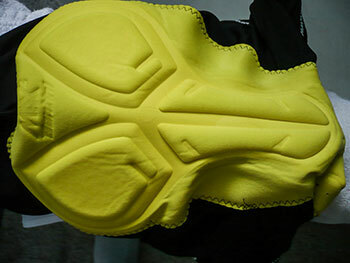 the santini badged leg grippers do their job remarkably well without stopping the blood from reaching both feet. 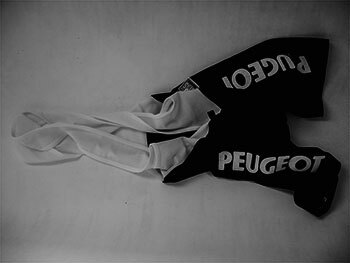 even after several washes, there is no sign of the words peugeot suffering any distress, while the interior of the embroidery offers no chafing or any other form of discomfort (before you ask). 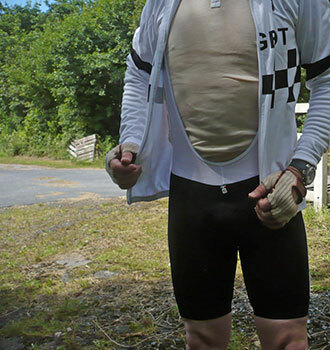 the bib section lies flat and troubles the shoulders not one whit. available in sizes ranging from xs (small size reviewed) in one colour (black), the 1984 peugeot replica bibshorts are available at the extremely friendly price of £69.95 direct from prendas.